My writing style is...good. This is the specific style that I choose to write in. I find it much better than other styles. Such as bad, horrible, or terrible. It isn't quite as nice as great or classic, but good suits me just fine. Eustice, is a first person book. I'm not really sure why I wrote it that way. It just seemed to be the most natural way to write it. I'm not tied to first person, though. I tend to stick close to the fantasy realm. Though, after I finish The Reaper Corps I'm thinking about writing a more autobiographical story about my experiences growing up with a stutter. I'll probably throw a dragon or something in it, otherwise I might get bored. Eustice is the name of the main character in the book. I originally had the idea of writing three books each from a different character's point of view and naming it after them. But when I started writing the follow up to Eustice, I discovered I really wanted to keep the story from her perspective. I actually wish I had named the book something less confusing and obscure now. Sometimes titles come first but most often for me they come afterward. Though, I guess it's more accurate to say I might have the idea of the title when I first map out the story, but as I write that map and the title tend to change. Sometimes dramatically. I didn't intend for any overarching messages or themes, but I'm sure there are some there. Readers tend to find messages and themes in anything. That is one of the reasons writing is so enjoyable. Everyone has a different take on what you write. But really with Eustice, I just wanted to tell an interesting and exciting tale. I'm nearly done with the next book in the Reaper Corps series. I haven't finalized the title or release date but I hope to have it out before April or soon there after. I had planned to be done with it by now, but my wife and I had our first child in December and that has taken over more of my writing time than I had planned. It is hard to share anything about the next book without spoiling Eustice. But I will say that it will resolve some loose ends from Eustice, as well as set up the third and final book of the series. And Eustice gets a closer look into the life of Alastor, Hell, and the demons. Persistence is worth more than talent. Dedication is worth more than ability. Writing is less about finding some grand inspiration as it about slogging through line after line of text. As the saying goes: anyone can write, only authors rewrite and edit. I'm a big fan of Tool and even if this is obscure I'll say their song Right in Two hits the mood and overall theme squarely on the celestial head. If you haven't heard the song, go to youtube, put on some headphones, and check it out. Eustice P. Jennings awakens alone and confused on an ugly piece of office furniture in Purgatory. Being dead is the least of her problems as she is quickly drafted into the dangerous Reaper Corps and plunged headfirst into the endless conflict between Heaven and Hell. Friends and allies are few and far as Eustice struggles to find her place in a surreal world she never imagined could exist. 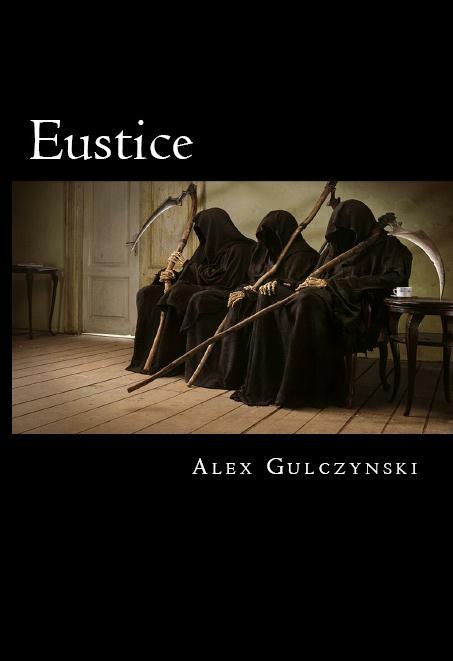 Eustice is Alex Gulczynski's debut novel. He is currently living in Seattle and teaching science to elementary students. He and his wife had their first child in December. He is using these sleepless nights to work on the next book to further the story of Eustice and Thayer. He hopes to have it out by March 2013.